Hope everyone is enjoying their week. My sweet kiddos are on Spring break this week, but we don’t have very Spring-like weather this week! So, indoor plans it is! 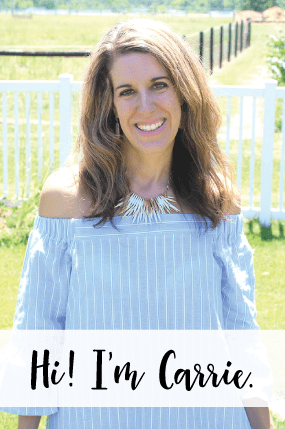 Today I’m so excited to share Day Two of the Spring Festival Blog Hop hosted by sweet Kendra at Joy In Our Home. 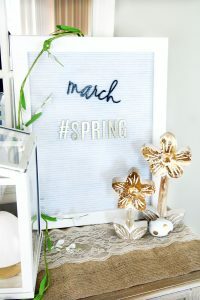 It may not be very Spring-like here, but at least I can enjoy Spring through this wonderful blog hop! 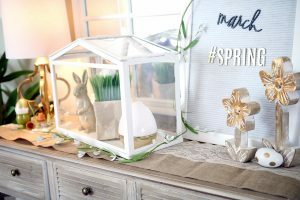 Tuesday’s theme is Vignettes and I am sharing several Spring Vignettes that I have displayed on my console table in our Family Room. Yesterday was Spring Tablescapes and today is Spring Vignettes! 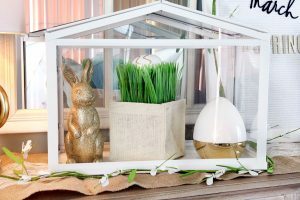 You can follow along below for the rest of the week to see some beautiful Spring Recipes on Wednesday, Spring Front Porches on Thursday and on Friday we are ending the Spring Festival with Spring Mantles! 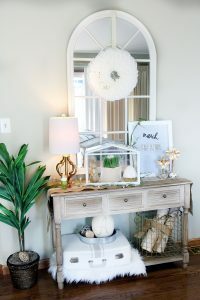 I’ve had this console table in our Family Room for awhile and I’ve shared it on the blog quite often, because I love to decorate it from season to season. 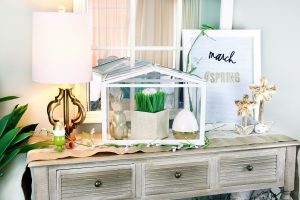 When Kendra asked me what theme I wanted to do for this blog hop I knew I wanted to share some of the little vignettes that I set up on this table. So, let’s get started! On the right corner of this table, I have my letter board that I purchased from Hobby Lobby. I love this board, it is sturdy and I have several letter and word grouping sets that I’ve purchased for it. 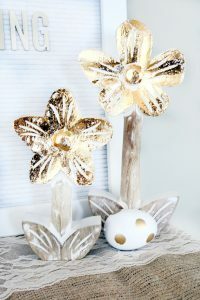 These two gold and white daisies were sent to me from Cracker Barrel’s shop a few weeks ago. I didn’t realize until I took them out of the box and propped them up next to each other that they were different heights! This terrarium from IKEA is just my favorite item on my console table! I actually took the kids to IKEA for lunch and their first IKEA trip yesterday! They loved it! 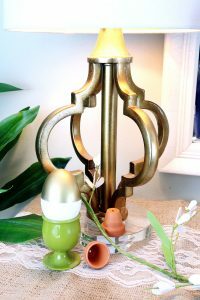 The gold glitzy bunny and gold color blocked egg are from HomeGoods (last year). I have a pot of grass with a gold chevron/white egg on top inside a burlap cover. The floral garland is from Target’s Dollar Spot and I wish I had picked up an extra one! 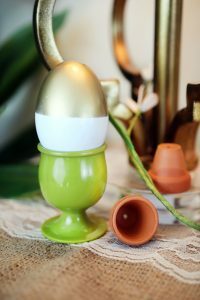 On the left side of the table, I have a gold based lamp that I got at Hobby Lobby and I have an egg cup, gold dipped egg and some mini terra-cotta pots. I love to get out this burlap runner with the white lace that runs through the middle of it for the warmer months. This is the bottom of the console table. I always have this old suitcase on top of a white fur rug, but I change up what’s on top of it. 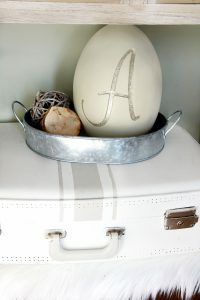 I put a huge ceramic egg that has a monogram on it in gold and some other natural items I already had in the metal tin. This gold wired basket is from Target. 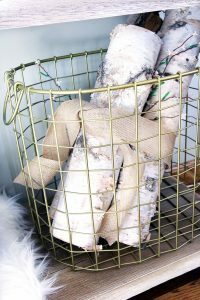 I filled it with some birch wood and a few clippings with blooms. I hope you enjoyed seeing all of the Spring Vignettes I set up on this table. 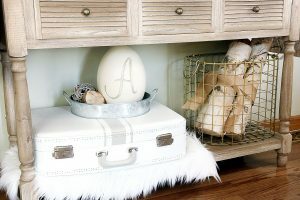 Be sure to stop by 2 Bees in a Pod, who is next up with her Spring Coffee Table Vignette with Nests!